Speed camera detectors alert you to fixed and mobile speed camera locations. Many GPS speed camera detectors have additional features that allow control over speed camera alerts for each type of speed camera. Below you'll find the latest 2019 speed trap locators available from ActiveGPS from the UK's leading detector manufacturers. See the buying guide below, FAQs webpage or phone 01733 777623 (Mon-Fri 9:30am-5pm). In the early days of in-car speed camera detectors they either used radar and/or laser detection. These early devices didn't feature a GPS database (the cornerstone of all 2019 models) and therefore could only warn to radar/laser based speed cameras on roads. 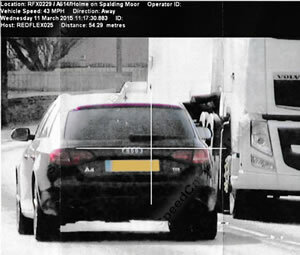 As roadside speed camera technology has developed since the first Gatso (radar based) speed camera was installed in 2001, new camera systems such as SPECS and VECTOR average speed cameras cannot be detected via a radar or laser detector. For these next generation speed cameras the only way you can receive an alert is via a GPS based speed camera detector. GPS based speed camera detectors rely on a database of GPS co-ordinates. These databases can be updated daily via a compatbile PC with internet connection. ‣GPS - GPS stands for Global Positioning System, the speed camera detector uses an updatable GPS co-ordinate database of fixed and mobile safety cameras. ‣Radar - radar is used for 'live' detection of radar based systems such as Gatso safety cameras. ‣Laser - laser is used for 'live' detection of laser based systems such as mobile laser safety cameras. "The latest generation of our previous favourite, the suction-mounted Cheetah c550, is our winner for its simple but effective approach. Camera and speed accuracy couldn't be faulted, and there were clear visual and audio alerts for distance and type of camera ahead. A countdown appears as you approach a camera and it'll beep if you're over the speed limit. The LED display is easy to understand and it's hard to go wrong with only a few buttons. The only improvement that could be made is if it showed the limit at all times. Subscription for updates is the best value here, too." 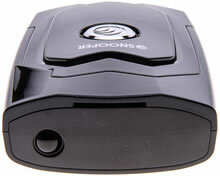 The Snooper 4ZERO Elite BT (pictured below) speed trap locator not only use a GPS database (alerting to fixed and mobile speed camera locations), but also include a radar and laser detector providing alerts to live cameras e.g. Gatso, handheld or mobile speed camera vans. Alerts are provided by the 4ZERO Elite BT display and by an internal speaker with spoken voice alerts. IMPORTANT: It is fully legal to use, own and operate a GPS/Radar/Laser speed camera detector in the UK. However, before using your detector outside of the United Kingdom we STRONGLY RECOMMEND that you check to ensure that the use of a speed camera detector in other countries is also legal. Both the Snooper 4ZERO Elite BT and Snooper MY-SPEED XL include FREE speed camera updates for the life of the device. The Snooper detectors use the Snooper AURA speed camera database which is updated daily. The Snooper MY-SPEED XL requires updates via a Windows based PC, while the Snooper 4ZERO Elite BT can be updated by either a Windows or Apple MAC based PC. The Cheetah c550 Platinum Edition model also comes with lifetime unlimited speed camera database updates. Therefore there is nothing to pay extra to subscribe to the Trinity 3.0 speed camera database. If you are travelling outside of the UK then the Snooper and Cheetah detectors offer speed camera locations for many countries around the world including Europe, USA, Canada, Australia and New Zealand. Please see the product pages for full details via the following links. In addition to speed limits at speed camera locations, which the Cheetah c550, Snooper 4ZERO Elite BT and Snooper MY-SPEED XL all provide, the Snooper MY-SPEED XL also features a comprehensive database of road speed limits for the UK and Western Europe. The MY-SPEED XL speed limit database uses here maps data and is free to update. Updates are released on an annual basis. All speed camera location and speed limit data is provided by Snooper and is updated on a daily basis. Pictured below the Snooper MY-SPEED XL's green 'safe alert' clearly indicates you are driving safely within the speed limit. Do you own an older speed camera detector? Looking for accessories? Origin, Snooper, Road Angel, Road Pilot, Talex and Novus. As well as the latest speed trap locators and their accessories (see above), we also sell a vast selection of genuine parts for detectors that have since been discontinued. Among the many systems we sell original parts for are the Origin b2 and Origin b2 Solo the forerunners to the Pogo Alert+ and Pogo Alert detectors from Origin Technologies, since acquired by Road Angel. Road Angel we have spares for Road Angel Gem and Gem+, Road Angel Professional and Road Angel Vantage. Some lines are no longer available, while other are very limited, however if you need to buy a replacement part its worth taking a look to see if the accessory you need is still available from ActiveGPS. From Snooper we have accessories for the Snooper 4ZERO, Snooper 3ZERO, Snooper Lynx GT Lite and LIVE, Snooper Sapphire, Snooper Tigre, Snooper Pantera, Snooper Evolution, Snooper S2 neo, Snooper S3 neo, Snooper S4 neo and the Snooper S6/S6-R neo, spares for the S6/S6-R neo systems also fit the S6/S6-R neo Plus model. Novus parts include accessories for the Novus Alpha, Novus Delta, Novus Delta Plus, the multi award winning and best selling Novus GPS Rider and the Novus Piccolo model. Finally, we also have a number of original accessories for the Talex range of GPS speed camera detectors, though some of these are limited in number. Accessories for Talex devices include parts for the Talex Lite and Talex. View accessories and parts for speed camera detector past and present.